"Do you remember me telling you how the faces of the men I killed came back, changed to father's, and became my own? He looks like me. Maybe I've committed suicide." Eugene O'Neill is one of the most important American playwrights in history, and Mourning Becomes Electra is his magnum opus. Based somewhat on Aeschylus' The Oresteia, O'Neill takes themes that had lain dormant in the Greek plays to the forefront of his. Passion, duplicity, incestuous desires, and post-war insanity clash against each other to create an epic of pain and betrayal. Only one film has been made based on the play, and RKO Pictures produced that in 1947. But post-World War II audiences did not want to see such downbeat fair, and especially not with such a long running time (it clocked in at over three hours, which was still far shorter than the full text of the play). That version of Electra has become a lost gem, and is still being unfairly overlooked. In 1979, a new version of the play was produced as a TV miniseries. This miniseries was plagued with bad acting, and breaking up the story into several episodes meant the epic scope of the piece was diminished. While its release on DVD has brought back the scope, the acting can't be saved. Set in post-Civil War New England, Mourning Becomes Electra concerns the Mannon family. Lavinia Mannon (Roberta Maxwell) has discovered that her mother, Christine (Joan Hackett), has been having an affair. She also discovers that her father, Ezra, is coming home from the war. Lavinia threatens to tell Ezra about Christine's love affair, but Christine hatches a plan with her lover to kill Ezra. She does so, and then Orin, Lavinia's brother and a notorious mama's boy, comes home. Christine convinces him that Lavinia is clinically insane, but Lavinia proves him wrong when she sneaks him to Boston so he can see Christine meeting with her lover. From there the betrayals pile on one another until no one can escape from their painful fates. As a work, Mourning Becomes Electra is an astounding mix of Greek myth, Freudian and Jungian psychology, classic theater styles, and reckless avant-gardism. Using general knowledge of the Orestian myth to craft the basic structure of the play, O'Neill writes his characters with certain psychological motifs in mind. Both Mannon children suffer from their own parent-loving complexes, Orin's is Œdipal, while Lavinia has signs of an Elektra complex. Christine accuses Lavinia of trying to take her place, while Orin several times openly declares that he would love his mother as her lover would. Considering the running length of the source play (over five hours), it could be considered "talky;" however, O'Neill knows when to employ some well-worn theatrical styles in order to keep the audience thrilled and satisfied enough to listen to the dialogue. The length and scope of the piece means it's more than just a revenge tragedy; it is more of a meditation on the meaning of pain itself. As a miniseries, Mourning Becomes Electra falls just short of being a complete flop. The most obvious problem here is the acting. These actors go with their gut instinct: to make every scene as over-the-top as possible—O'Neill turned into cheap melodrama. Even when the characters are whispering or in seemingly calm states, they're still playing their roles three times larger than they should be played. Of all the actors, Bruce Davison comes out with the most integrity, but you can tell this wasn't a major performance from him. Peter Weller also appears, and confirms why he's stuck doing movies like Screamers. Between Joan Hackett and Roberta Maxwell, I can't say which I think is worse, unfortunately. As mentioned above, another problem with the miniseries was that it was broken up into episodes. While the DVD still has the episode breaks, you at least don't have to wait a day or week to see the next installment. This allows you to see Mourning Becomes Electra in relatively unbroken succession (each episode ends with an afterward by Erich Segal, which is often more interesting than the show itself), so the scope that the piece so desperately needs is regained. That, coupled with the writing, are the only saving graces of this miniseries. While the actors blunder their way through, the writing is so strong that it overcomes the performances to shine through on its own, while a sense of epic scope gives the miniseries the weight O'Neill intended. These things alone prevent the show from being a total flop. Image Transfer Review: Mourning Becomes Electra has a horrible transfer. There is actually a warning at the beginning of the program that DVD, being a high-resolution digital medium, may show flaws in the source material due to poor quality in the original production. Well, that warning immediately comes true. From the start, the picture looks faded, and it just gets worse. Long shots are blurry, details are scant, often you can see scan lines, as if you were watching it on the original television broadcast. It's like someone taped this miniseries off of TV, and that tape was copied and used as the source material for this DVD. The grade bumps up to a D- because Image acknowledged the poor visuals up front. Audio Transfer Review: The sound here leaves much to be desired. The mono pushes the score down to the point where it's sometimes inaudible, while the voices sound loud and harsh. Even when Lavinia is whispering, every "s" sounds like it's scratching your eardrums. Extras Review: While there are no official extras, each episode finishes with an afterward by Professor/Author Erich Segal. These afterwards provide invaluable insight to the influences on the work, why certain scenes were so avant-garde at the time, the juxtaposition of differing theatrical styles O'Neill employs, and more. Not a promoted extra, but worthy of mention nonetheless. 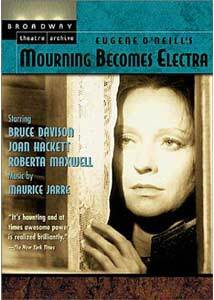 While certainly a masterpiece of American theater, this 1979 miniseries of Mourning Becomes Electra doesn't do the massive work justice. Simply put, the actors don't have the depth and experience to pull off these extremely challenging roles (or at least they didn't at the time; I'd like to see Peter Weller and Bruce Davison reprise their roles now). The only reason to recommend this is because the writing is so strong that it affects the audience, even when delivered poorly, and because the 1947 RKO version is not readily available.